Most of us can’t stop ourselves from buying stuff we don’t need. We can’t resist the temptation of loading up our shopping cart whenever we are at the grocery store or the department store. Some of us even buy things we want even if the price is unreasonably high. That is why, all of our money could disappear in a flash right after pay day. However disastrous this behavior is, it is not easy to get rid of a habit that you have been used to for such a long time. It will require you to exert a lot of effort in order to replace it with a new one. Nevertheless, it is still important to try to learn how to save money and make it a regular part of your buying behavior. So here are some tips on how to save money when you shop. A list is essential in order to keep track of your plan to save up. You have to create a list of the items that you need to buy at the grocery store or the department store. 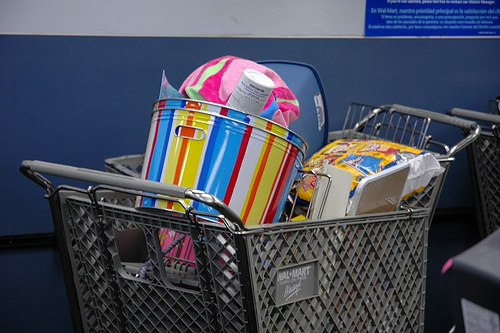 If you have a list, you will be able to estimate the amount that you will spend on your shopping. You have to set aside the money that you will need and nothing more. It is very tempting to shop until you drop - to just pick up all the things you want as long as you still have the money. However if you are determined to save, you must stick to a list of items you intend to buy. You have to prioritize the things that you need over the things that you simply want. You also have to check and compare prices and follow the quantity that you have on your list. Using your credit card to shop has one important drawback. It’s not easy to control how much you spend with a credit card. So in order to shop wisely, bring cash for the things that you have to buy. It is best to have only the exact amount so that you will not have to face the temptation of buying more things than you need. If you are determined to save money while you shop, you should always consider the stores that you already know to have all your items with the best prices. I know you may consider shopping a fun experience that can to be done in a leisurely way. But that leaves you open to wanting more than what you need. Generally, it will help your saving initiative to keep a simple route in order to just get what you need and be done with it. One of the reasons, malls give out discounts sales is to compensate for the seasonally low volumes. This is aimed to gain more sales when people are just not in the mood to buy. That’s probably the case because people really don’t need things during these times. But if you’re not careful, these discount sales can lure you into thinking you have to shop. So when you see a sale, think about the tactic being used by shopping malls and buy only if you have a need.